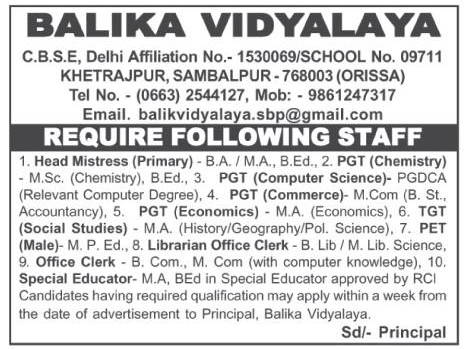 Balika Vidyalaya, Sambalpur has advertised in Sambad newspaper for the recruitment of PGT plus TGT job vacancies. Interested and eligible job aspirants are requested to apply with in a week. Check out further more details below. About School: Balika Vidyalaya, CBSE, Khetrajpur,Sambalpur was established in 1973 by Mangelalji Agrawal under the guidance of Madan Lal ji Agrawal under the name of Balika Vidyalaya Educational Trust with a vision to provide quality education and infusing children with greater degree of confidence to face the challenging future. Today’s generation has got a lot of potential. They are born with sheer determination to achieve greater goals. Children are our future and the school believes helping the children to fulfill and achieve their dreams. With so many challenges and competitions, the school continues working on innovative working concepts to make education meaningful.